I’m often asked how companies can attract magnetic leaders to their organizations. Here’s where to begin. Showcase your organization. There are many great organizations out there, although you may not know it. That’s because a lot of companies are best kept secrets. This is the last thing you want to be when looking to attract and hire magnetic leaders, or any talent for that matter. 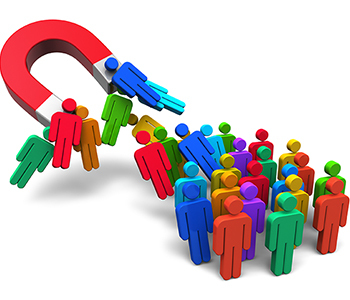 Magnetic leaders, those whose leadership style is irresistible, are in high demand. This means they can be fairly selective when deciding whom to work for. You’ll have a hard time attracting magnetic leaders to your organization if they have no idea who you are. You need a strong employment brand that will pull magnetic leaders towards you. Here are three ways to bolster your employer brand, quickly increase your company’s visibility and attract magnetic leaders. 1. Create a blog on your website that paints a picture of what it’s like to work for your organization. Highlight some of the interesting projects your organization is working on; include photos of the team in action. Have your CEO on camera and post videos of the CEO speaking from the heart. 2. Refresh your company website. Whether we like it or not, image is important. The first thing candidates do these days is to check out a company’s website. You’ll have an extremely difficult time pulling in a magnetic leader if your site appears old and outdated. Magnetic leaders will quickly move on to other sites if it appears that your business isn’t investing in itself. 3. Share your company’s viewpoint. In my book, The Magnetic Leader, I write about how Ray Pawlicki, former CIO for Biogen, spoke everywhere he could. This included association meetings, conferences and clubs on college campuses. It didn’t take long before magnetic leaders started reaching out to Pawlicki to ask him for a job. Raise the level of leadership in your organization. It’s no secret that great people want to work with other great people. If you want to attract great magnetic leaders to your organization and raise the bar of your current group of leaders, you’ll need to raise your game. It’s time to clear the deck. Remove leaders who simply occupy space. Once you’ve made room in your organization, look to curate a team of “A players”. Once you’ve been able to recruit one or two highly regarded leaders, others will follow. Spread the news. Send out press releases whenever magnetic leaders join your organization. This will send a signal to others that your organization is moving into a new league. Assess your current leaders. Identify areas where further development may increase your leaders’ abilities and magnetism. You can then choose from an array of delivery options such as onsite training, online courses and executive coaching. Review your compensation and benefits package. People will tell you that money doesn’t matter. Those people usually have more money than they know what to do with. Money matters. Be prepared to pay top dollar. Magnetic leaders are considered top talent. If you want top talent, then you need to be prepared to pay for it. A competitive benefits package will be necessary. Salary surveys are one way to determine the going rate. Given the record low unemployment rates in many parts of the country, a better measurement may be what applicants are currently asking for in terms of compensation and benefits. The investment needed to assemble a team of magnetic leaders will have what I call a ROM (Return on Magnetism). That’s because people do business with people. A team of irresistible leaders will attract a higher quality workforce, more customers and more profits. And who doesn’t want that? Her most recent book is The Magnetic Leader: How Irresistible Leaders Attract Employees, Customers And Profits. Previous books include Suddenly In Charge: Managing Up, Managing Down, Succeeding All Around (Nicholas Brealey, 2011) (a Washington Post Top 5 Business Book For Leaders) and Talent Magnetism (Nicholas Brealey, 2013).